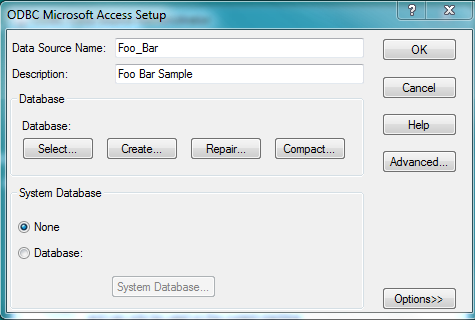 Using ODBC with Windows Seven. Next: 21-Jan-2012 Converting HTML to PDF. Of course despite all the hype (and the new name) Windows Seven is little more than Vista SP2 ... But at least Microsoft has fixed many of the more glaringly obvious flaws that shipped with Vile Vista version 1. And so I got some hands-on experience with Windows Seven. Remarkably Microsoft now have a switch user function that actually works! It is ironic that Ubuntu have had a perfectly functional switch user function for many years ... But it is now broken due to poor integration with the new Unity interface (this may be due to hardware limitations --- I have not yet tested Unity on modern hardware). Of course Windows Seven is not without its foibles ... All of the menu items have been moved around so you can't find anything any more ... For example, the task scheduler is now hidden in "Administrative Tools". An error has occurred for task weekly_upload. It seems that when creating a scheduled task you must tick one of the boxes Run only when user is logged on or Do not store password. The task will only have access to local computer resources. And Some further efforts have made been toward fixing the eternally flaky task scheduler ... And it certainly needs it! ... You might recall the original version which only ran as administrator ... The version that behaved in a very weird manner unless someone was "logged on" ... The strange and wacky problems with networked drives ... etc ... etc. With the new version, tasks seem to run more reliably in the background. But weird file locking errors do occasionally crop up ... And it seems that when it comes to running tasks without a terminal, the geniuses at Microsoft still just don't get it! Alternatively, if you wanted to, you could probably mount C:/Users as /home. It also seems that the brains trust at Microsoft have been pondering about security and how to handle "privileged mode" (without sudo). Files such as the hosts file (which is now stored in C:\Windows\System32\drivers\etc\hosts), can only be modified if the editor is Run as administrator (e.g. right-click on Gvim and choose Run as administrator). Finally Microsoft has decided to opt for sensible default names for each user's home path (C:\Users\login_name -- see above for experiments with cygwin). So the user "foo" would by default have downloads stored in C:\Users\foo\Downloads. Connecting To Access With Activestate ODBC. Activestate perl installs ok with Windows 7. If you don't have proxy servers etc, you can get cpan working simply by starting it from the command line. By default cpan will try to install dmake and the MinGW gcc compiler. These will be setup in C:\Perl\site\bin. A screen will pop-up as below. You should choose the Add option. After you choose the Add option. 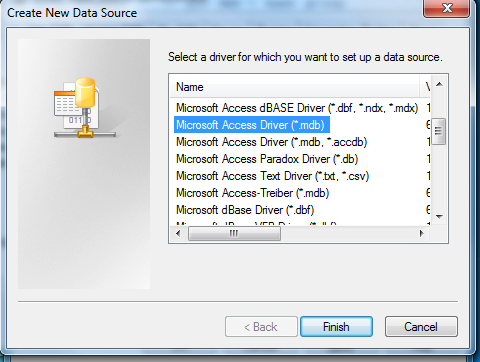 You will be presented with a list of options as below ... You should choose the Microsoft Access Driver. 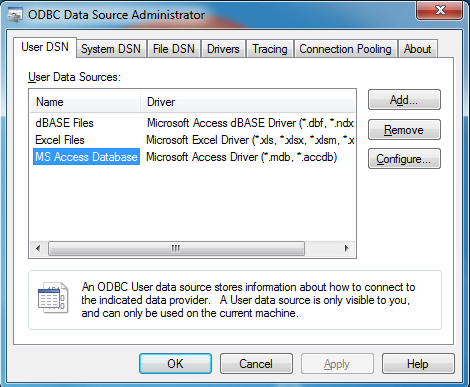 After you choose the Microsoft Access Driver, in the next screen (below) fill in the details for the new ODBC connection as below, and click on "Select". 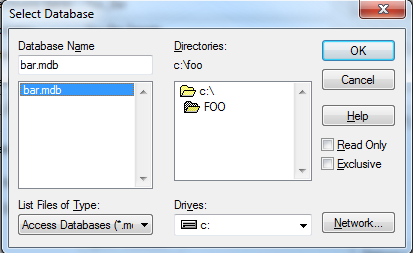 Finally, in the file dialogue which pops up, choose the folder, and you should see your .mdb file ... Select it and click "ok". Getting your new ODBC connection to work in perl. There are several utilities online which offer ODBC connectivity. However most of them don't seem to add much functionality to the basic dbi::ODBC package that ships with the standard Activestate distribution. The code below is a snippet generated with a perl script. Note: One of the first problems I encountered was the length of items in Memo fields, which is the reason for the LongReadLen and LongTruncOk modifications. Also there are a some annoying non-ISO characters (e.g. 'smart quotes'), from various Microsoft products. These were handled by the massage() subroutine, which gets rid of carriage return and line-feeds and smart-quotes ... Other characters are marked up in a rather ham-fisted manner ... You might want to uncomment the #debug# statements while you attempt to tailor the conversion script to your data. (YMMV). Next In Thread: 21-Jan-2012 Converting HTML to PDF.